All workplaces must keep a record of injuries that happen to employees, contractors or visitors on site. 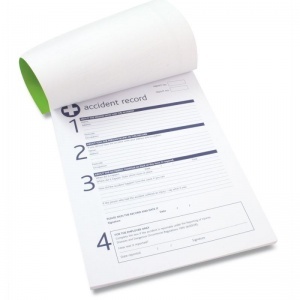 The First Aid Accident Record Book is an easy to follow book with forms to keep record of any accidents or injuries incurred in the workplace and what action was taken. This allows for employers to identify any commonly occurring injuries so that they can take corrective action. It is important that whenever an injury is incurred in the workplace that the designated first aider fill out an accident record detailing what happened and how the accident was dealt with. This publication provides helpful advice on how the accident book should be used and an introduction to reporting of injuries (including what injuries do not need reporting), diseases and Dangerous Occurrences Regulations 1995. This ensures that your place of employment is covered should ever the Health and Safety Executive call upon your records. To ensure you comply with the Data Protection Act 1988, the book supplies you with tear-off report forms to allow for the details of the injured party to be kept filed in a safe and secure place. The A4 book should be stored somewhere visible so that it is on hand whenever it is needed. 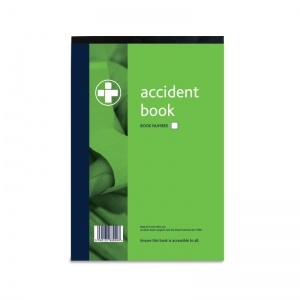 The First Aid Accident Record Book is usually dispatched via First Class Royal Mail and delivery should be within 1 to 3 working days.